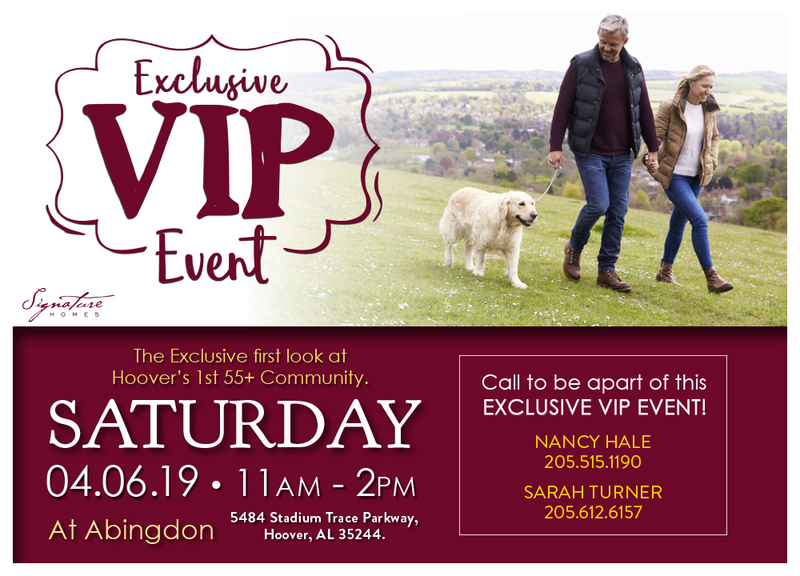 The premier active-adult 55+ community in the Hoover area. Set within a master plan with resort-style amenities. A part of the Wilborn resort community, this active-adult neighborhood has been designed to offer an unparalleled array of amenities, including a 124 acre park along the Cahaba River with canoe launches, 73 acres of outdoor hiking and biking trails, a 21-acre lake, a 5,000 square foot wellness center with zero entry pool, an AstroTurf wiffle ball field, pickle ball court, and numerous pocket parks and green spaces. Meet with friends for art, cooking, and dancing classes or enjoy a glass of wine around the fire. Set sail on the Cahaba River or peruse the Birmingham Museum of Arts. It’s time to focus on you. Stretch your limbs with a new cardio routine or get lost in a good story in your new favorite reading nook. On the corner of perfect and match, the good life is waiting for you at Abingdon at Lake Wilborn. © 2019 Abingdon at Lake Wilborn. All information assumed accurate but not guaranteed.